Finding the perfect house can sometimes feel like an impossible task. But if you’re looking for a renovated farmhouse retreat to call home, I know of the perfect one that just hit the market. It’s one I fell in love with, and I’m sure you will too as you learn the backstory and see the stunning photos. Being a city girl, I never had a strong reference for what a country farmhouse truly was. During my childhood, my mother was able to regal about the white house, chickens and fresh vegetables of her childhood home. 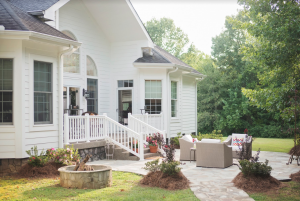 When we first moved to Wilson County, we quickly realized why it was so special — from the beautiful countryside with ample opportunities to have a home with 2 to 20 acres to the ability to live quietly in the home of your dreams. For us, this dream started just about six years ago when we started looking for a new home. Robert, my husband, and I set out to find a home with the characteristics that would suit our personalities. I tend to think of Donny and Marie Osmond: She’s a little country, and he’s a little rock and roll. Our tastes are eclectic and genuinely unique. 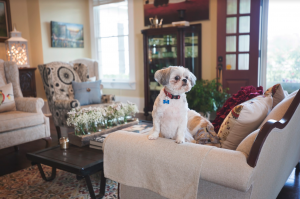 The thought of a 200-year-old farmhouse was exactly what I was targeting — from the large kitchen and farm sink to the large quantities of windows that would brighten the dream home and provide cross ventilation in the summer. I knew a white farm house, with character and personality, was exactly what we were going to find. Fast forward several months later: no farmhouse, no new home with character, the dream was fading away. Until one day, I stumbled upon a beautiful sprawling home on Coles Ferry Pike. As with all of the homes we were looking at, I called my partner in the house-hunting venture, Cathy, so we could go together and check it off the list. This time was different. Completely different. We were waiting at the front gate, anticipation building while entering the front gate code, I could see this home was different. 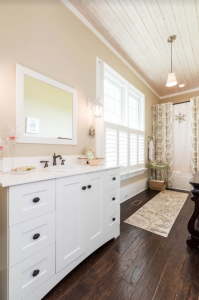 This house has character, from the 10-inch baseboards to the tongue and groove whitewashed ceilings throughout the home. I was already feeling at home and had only stepped in the front door. We looked at each other and excitement took over. We felt as if we were two young girls running around their grandmother’s farmhouse going from room to room yelling at each other. 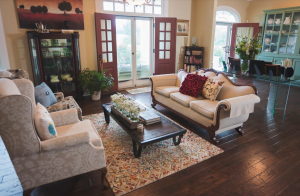 Did you notice the hickory flooring? Did you see the quilt closets? Then it hit me, this was home. Fast forward to 2017, and we have been asked many times what did we fall in love with when it comes to this home. There are too many attributes to mention, but the legacy of the home is what makes this house a home. Mr. and Mrs. Bay lovingly built this farmhouse, a replica of the farmhouse her grandmother raised her family in. So many of the details were included in the structure and design. 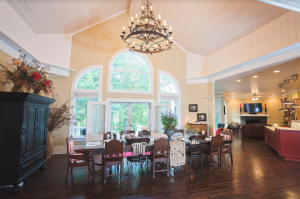 With more than 37 windows in the home, you have natural light from all angles. When swinging open the French doors on the back side of the house, you will enjoy the serenity of Barton’s Creek. I remember the first time I stepped into the kitchen, my thoughts were in anticipation of the family meals, the entertaining and the time we would be spent in this warm space. This is when I knew whoever originally designed this home must have a love of family and food, too. This is a dream kitchen, from the double farm sinks (every country kitchen needs a vegetable sink!) 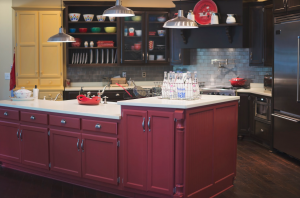 to the custom cabinetry in wood, yellow or red to the Corian counter tops. But we cannot forget the modern appliances, the heartbeat of the gathering place, including the Viking Professional Series kitchen and vintage-designed eight-burner gas Viking Stove, customized with four burners, a griddle and a grill. There’s also the double Viking Professional refrigerators, lovingly referred to as His and Hers, as well as the Fisher Paykel double dishwashers. This kitchen has seen many gatherings in its time. After being giddy from seeing the kitchen, eat-in kitchen and den with a gas fireplace, we decided to explore the rest of the home. If the open-concept living area was this wonderful, what else would we discover? In true adult fashion, we found our next toy! Why was there a key in the wall? Of course, we needed to find out, and it was the chandelier lift. The wagon-wheel inspired, multi-tiered, wrought iron chandelier had a lift to lower for decoration, cleaning or general light bulb maintenance. On to the master suite, and yes, this is a suite. 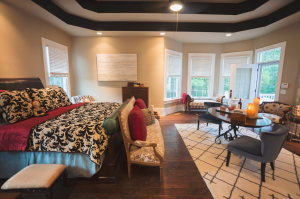 With a master bedroom larger than most couples’ apartments, the windows and natural light are amazing. It has a walk-in his and hers master closet, double vanities with Corian counters (a theme in the house) and large, open-tile shower. This truly is a place of relaxation and reflection. Meandering through the home, we found all three bedrooms, bathrooms, oversized laundry room and then rooms no one ever expected: the game room, craft room and a room that has since been named Peggy’s Piddlin’ Room. 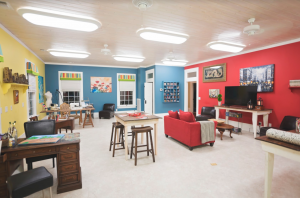 This room was made for crafting, art, sewing, games and family fun. 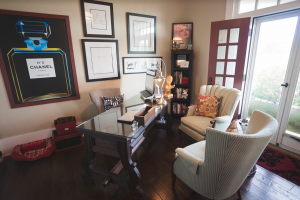 This is the room where all of the creative fun and family time happens. Beyond the master, there are two additional full baths, which have unique designs and cabinets. Each has a sink built into furniture, recessed lighting — as with the entire home — and tiled floors. Not to mention, the additional two half baths. Plumbing was well designed down to the utility sink in the oversized laundry room with enough space for ironing and hanging your clothing. The home’s main living space has decorator shelving with plugs every few feet to display your collectibles. I can only imagine how Christmas Village would have looked up there meandering around the den, living room, into the hall and wrapping around. A child’s dream, or any adults dream! You’ll also find recessed lighting with the details of many individual switches to accent specific spaces in the home. Timers are set for the exterior lights, motion sensors for the drive lights and a light on the keypad for the main gate entrance shows how important lighting is when looking at every detail of the home. There is plenty of exterior space to enjoy, as well. The front porch has double benches you will find yourself relaxing on and watching the world go by. The side porch is just perfect for iced tea and conversation. But the back porch and back deck are the areas of great pride. From the custom-laid flagstone patio, walkway and fire pit, you will enjoy any time of day overlooking the water and listening to the sounds of nature. The smallest exterior details, but with the biggest impact, are the inconspicuous holes in the driveway. These holes are there for the family that plans for large-scale reunions, parties and in general fun. Each hole is spaced for the exact width of a large event tent to be set up in the driveway. And the best part about this inviting home is that it’s for sale. While I’ve definitely fallen in love with this home, it’s time for a change. But I know whoever buys it will build just as many — if not more — great memories in this timeless home. This country farmhouse at 6495 Coles Ferry Pike has all of the details, alcoves and special nuances of your grandmother’s farmhouse with modern amenities. 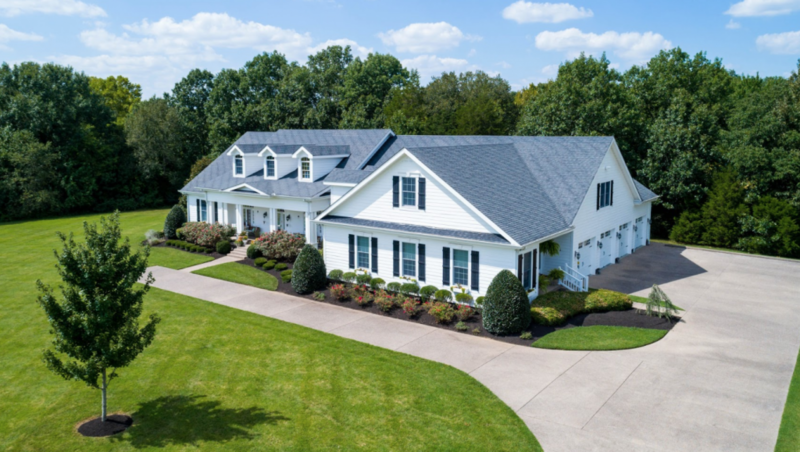 This 4,800-square foot home has three bedrooms, three full and two half baths, four-bay garage and additional space to build out. It has two walk-in attics, an estimated 1,500 square feet of framed-in space for expansion, an irrigation system, gated front entry with solar-powered entrance, Trane CleanEffects whole-house filtration system, tankless hot water heater, three Trane HVAC units and sits on just under 2 acres on Point Barton: You’ll want to call this home. 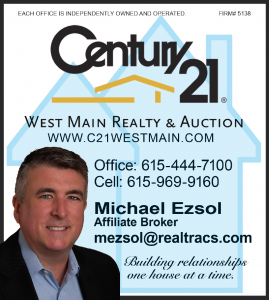 To view this farmhouse retreat, contact Michael Ezsol at Century 21 West Main Realty. Michael has lived in Lebanon for the past 15 years and says he enjoys working with families to find their perfect home. He makes the entire process as easy as possible for his clients, surrounding himself with industry professionals who can help solve any issue that comes up. Michael Ezsol is a full-time, dedicated agent who provides clients with all of the facts and information they need to make a decision about what’s best for them. Contact Michael to learn more about this custom farmhouse before it sells, or schedule a private showing. Visit Cfpfarmhouse.com for more information and video tour.